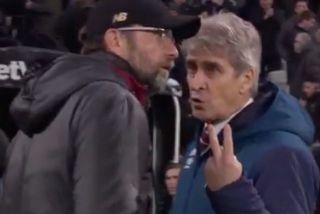 Liverpool boss Jurgen Klopp and West Ham counterpart Manuel Pellegrini appeared to engage in a rather heated exchange after the 1-1 draw at the London Stadium on Monday night. As seen in the video below, the two managers appeared to have an exchange of views after the full-time whistle, with neither seemingly too happy. It came after Sadio Mane’s opener was cancelled out by Michail Antonio, with Liverpool seeing their lead at the top of the Premier League table now cut to just three points by Manchester City. With tensions perhaps high and decisions not going in his favour, Klopp didn’t seem too impressed with Pellegrini’s attitude, as seen in his post-match interview with Sky Sports below, while the West Ham boss had a scathing remark of his own as he seemingly still holds a grudge from a previous meeting between Malaga and Borussia Dortmund. It would appear as though the pair aren’t the best of friends, while Monday night’s result now piles the pressure on Klopp and his players as they run the risk of surrendering a once commanding lead over City with Pellegrini and the Hammers dealing them a real blow. Jurgen Klopp joins us post-match to chat about Manuel Pellegrini and tonight’s referee.